The 32.31 metre motor yacht Maximus II, listed for sale by Michael Selter and Neal Esterly at Fraser Yachts, has been sold with Brian Hovey at Chuck Hovey Yachts introducing the buyer. Built in GRP by Taiwanese yard Horizon Yachts, she was custom built and delivered in 2005. Unlike other yachts in this size range, her original owner resisted the temptation to squeeze in four cabins, so she accommodates six guests in three large cabins, each with a king sized double bed, entertainment centre including a flat screen television set, and an en suite bathroom finished in granite. Maximus II boasts an elegant interior in satin finished cherry wood and a saloon floored in hardwood, complemented by rich custom rugs. In the large lounge area, light pours in through the large windows and there are two settees to port, two armchairs to starboard with a coffee table and an entertainment centre including a 50 inch HD television screen and a Bose surround sound stereo system. Forward is a formal dining area with seating for eight guests, storage for dinnerware, and a full wet bar. The sky lounge is large and has nearly 360 degree views with two large skylight hatches that provide excellent lighting and ventilation. This area is decorated with a teak & holly sole and a large oriental carpet. The helm accommodates five 17-inch computer screens. Centerline there is a Stidd black leather helm chair and a raised leather bench seat to port along with a built-in refrigerator and ice maker, and a 42 inch television screen on a rise and fall mechanism. To starboard is a U-shaped leather settee with seating for six. Twin 1,550hp Caterpillar diesel engines give her a cruising range of 1,500 nautical miles. 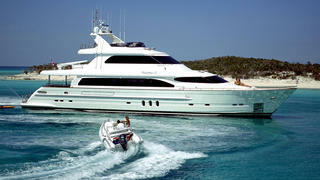 Lying in Fort Lauderdale, Florida, Maximus II was asking $3,995,000.